The Secret Diary of Steve Jobs : Cornered Clintstones attack: This Obama guy is black! Who knew? Cornered Clintstones attack: This Obama guy is black! Who knew? So over the weekend the desperate Clinton campaign began circulating this photo of Barry Obama in an attempt, I guess, to make him seem scary. Drudge has the story here. 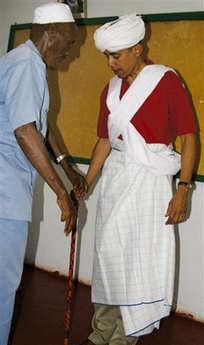 Turns out Barry was on a tour of Africa when the photo was taken. But I guess we’re supposed to believe that maybe he’s some secret Al Qaeda operative and the photo was taken at his graduation from terrorist training school. Hoo boy. Gosh, folks, guess what? This Barack Hussein Obama fellow comes from Africa! He may even be related to some Muslims! Does that outfit look familiar? Maybe remind you a little bit of this guy? Folks, he’s not one of us! Does he really share our values? Can we trust him? Do you really want to elect a big scary dark-skinned foreigner who wants to destroy our nation and give away all our jobs to the special interests and leave all our children behind and not give health care to everyone? Now the Clintons are dragging out the old tried-and-true “find a scary black man and attach him to your opponent” trick. Goddamn this makes my blood boil. Good news, I think, is that this time I believe the tactic will backfire on the Clintons and make them look like the craven, ugly, power-hungry creeps they truly are. Turning whites against blacks, turning one religion against another — that’s the crap we’re all sick of and that’s exactly why people are going crazy for Obama. So go for it, Clintstones. Show your true colors. You know what? I’m betting American people are better and smarter and a lot less bigoted than the Clintons give them credit for. I’m betting a lot of Americans feel really good about a dude who can travel to Africa and the rest of the world and reach out to them and respect them and earn their respect in return. Just a hunch.